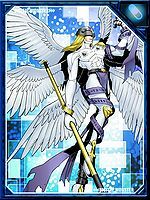 An Angel Digimon with six shining wings, whose body is clad in cloth so pure white as to be divine. It is a being of perfected virtue, and although it is called a Digimon that brings happiness, when confronting evil it does not stop attacking, with extreme composure, until the opponent is completely annihilated. 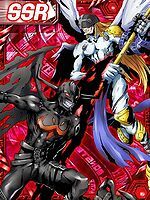 On the countless times when the Digital World is visited by a crisis, it is told that it descends to lead Digimon of the same genus, and Devimon, which was won over to the Dark Side, was originally of the same species. 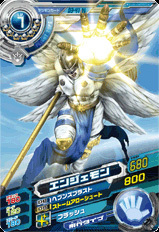 Its Special Move is striking the opponent with its fist shining gold (Heaven's Knuckle). 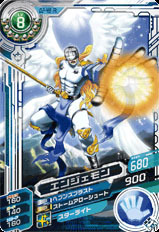 An Angel Digimon with six shining wings, whose body is clad in cloth so pure white as to be divine. 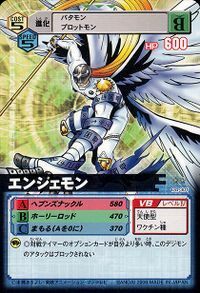 It is a being of perfect virtue, and although it is called a Digimon that brings happiness, when confronting evil it will not stop attacking, with extreme composure, until the opponent is completely annihilated. Devimon, which was won over to the Dark Side, was originally of the same species. This profile matches the one used on the Digital Monster site, except for the inclusion of paragraphs. — Digimon Adventure: "Revival! The Devil Venom Vamdemon"
— Digimon Frontier: "The Chosen Ones!? The Children who Manipulate Angemon!" 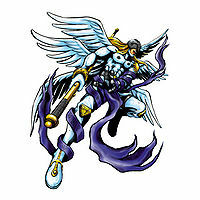 A Digimon which has 6 shining wings and is clad in pure white clothing. It is an existence of complete 'good', and is said to bring happiness. It is extremely harsh when facing evil beings. 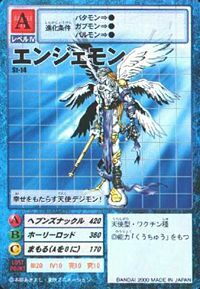 An Angel Digimon with six shining wings, whose body is clad in cloth so pure white as to be divine. It is a being of perfected virtue, and although it is called a Digimon that brings happiness, when confronting evil it will not stop attacking, with extreme composure, until the opponent is completely annihilated. On the countless times when the Digital World is visited by a crisis, it is told that it descends to lead Digimon of the same species. 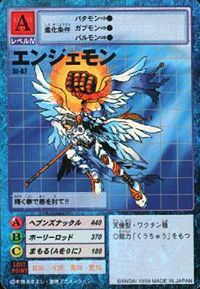 n., Short for Angel (「エンジェル」 Enjeru), which is a messenger of God. 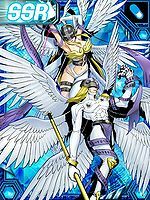 Anime/Manga Digimon Adventure: "Angemon's Awakening!" Heaven's Knuckle  ヘブンズナックル Hebunzu Nakkuru Hand of Fate/Heaven's Knuckle/Hand of Destiny/Fist of Fate Gathers holy power in its fist and shoots a beam of holy light from it. God Typhoon  ゴッドタイフーン Goddo Taifūn Angel Typhoon/Omni Typhoon Spins its Holy Rod or both itself and the Holy Rod to create a tornado. 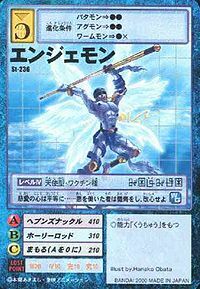 Holy Rod  ホーリーロッド Hōrī Roddo Angel Rod/Holy Rod/Celestial Rod Hits the opponent with its glowing Holy Rod. Uses its Holy Rod to pick up an enemy and slam it into the ground. Trips the opponent with the Holy Rod. Spins through the air swinging its Holy Rod. Flaps its wings to stay airborne. Fires a bullet of holy energy from its spinning rod. 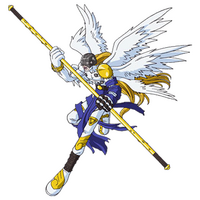 Angemon is the Digimon partner of Takaishi Takeru. 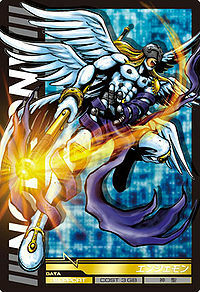 Angemon appears as a guard for several non-chosen kids by Ofanimon who chose to remain in the Digital World. He was killed by Dynasmon. On the first episode, Taiki is in a dream where a mysterious army is battling against Taiki's Digimon army. 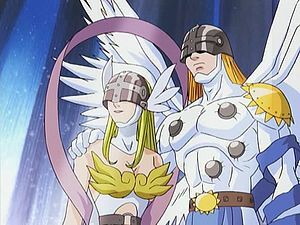 Angemon is part of that army. 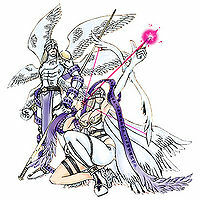 Angemon also appeared as Baalmon's mentor, and the former leader of the Warriors of the Goddess and Sand Zone. 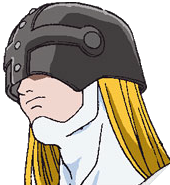 He was controlled by Ebemon under the orders of Lilithmon and then killed by Baalmon. 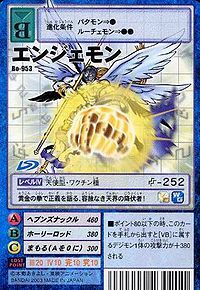 Patamon evolves into Angemon in order to fight Bakumon. 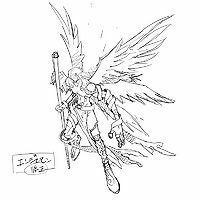 Angemon appears as an obtainable Adult-level Vaccine type Digimon in Digimon World. 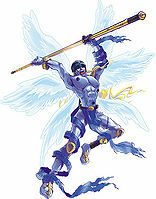 An Angemon is found inside the Ice Sanctuary in the entrance, as a frozen statue. 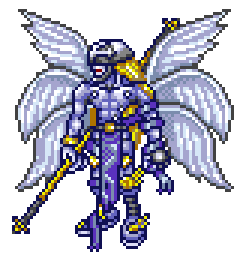 The Player tries to interact with the statue but nothing happens until their Digimon notices that there's a staircase below Angemon's Statue and they enter the Ice Sanctuary. 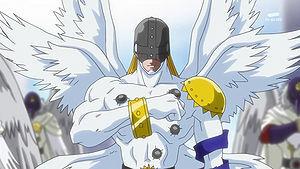 After clearing the dungeon and defeating the Hyougamon and Icemon bosses, the statue will thaw out and Angemon will be revived, thanking you and joining the Village of Beginnings where it joins Jijimon in his house and hints the Player to where to go next and how to recruit the Digimon the Player hasn't recruited yet. 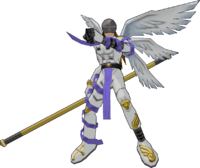 Angemon's Digivolution item are the White Wings which lets any Child Digimon evolve into Angemon. Devimon (Death Evolution. When it fights against another Digimon and loses a heart while its Discipline gauge is below at 50%. This has a random 50% chance of happening so its reccomended to save before trying it). Angemon fists the opponent with its shining gold knuckle that would cause an explosion. 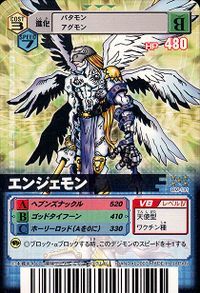 Angemon is the holder of the Holy 7s card. 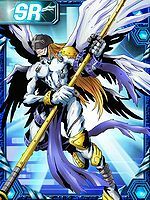 Defeating Numemon releases Angemon whom reveals that Numemon wanted to force the peaceful Digimon in Meditation Dome to attack Digital City and the tamers there. Angemon returns to Meditation Dome where you can talk to him anytime. 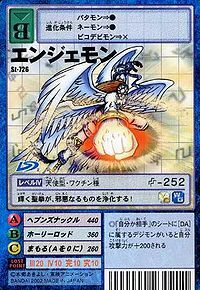 Angemon evolves from Clear Agumon (0-2 DP) and Patamon (8+ DP) and evolves into Andromon (0-5 DP) or Holy Angemon (6+ DP). 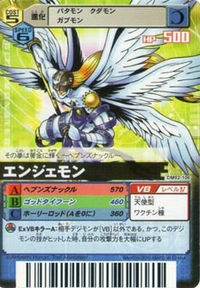 Angemon is the last opponent on Pyramid City's Battle Arena. He is also an obtainable Green Card. Evolves from Patamon (Pegasmon, or Pipismon) at level 21 and can evolve at level to Holy Angemon at level 31. 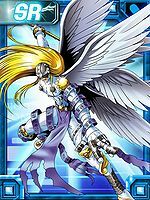 Angemon is an obtainable Digimon. 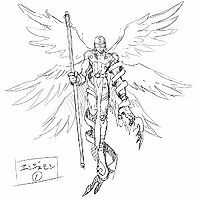 Angemon is the second form of Patamon. His main attack is Heaven's Knuckle. 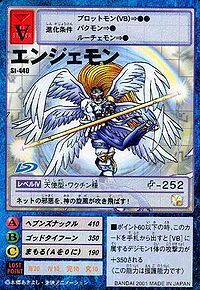 Angemon can evolve into Holy Angemon. Can be evolved from Patamon if above level 13 and Holy EXP above 30. 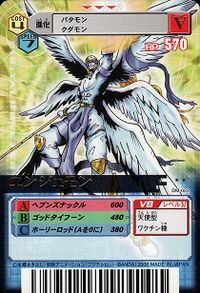 He can evolve into Holy Angemon if above level 25 and Holy EXP above 800. 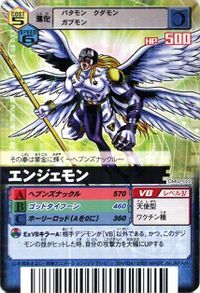 Angemon is an obtainable evolution of Gaomon. Can be evolved from Patamon if above level 19, friendship 70%, and Holy EXP 300, or can be found at Access Glaciers. 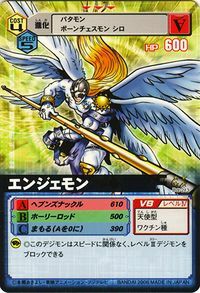 Can evolve to Holy Angemon if above level 34, spirit 160, and Holy EXP 3100. Can be jogressed with Devimon to become Lucemon Falldown Mode. Evolves from Patamon, Plotmon or Floramon. Can evolve to Holy Angemon, Angewomon or Piccolomon. 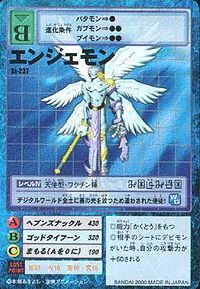 Evolves from Patamon and can evolve to Holy Angemon. 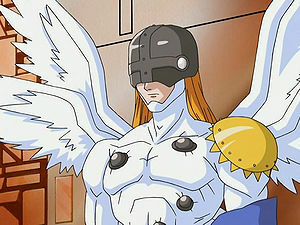 Angemon is the partner of Sebastian. 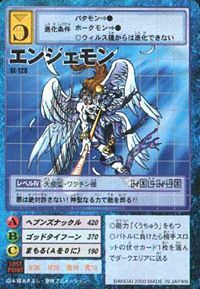 It is also an obtainable Digimon which is evolved from Agumon, Patamon, or Piyomon, and can evolve to Angewomon, Holy Angemon, or Vamdemon. It can also be obtained as a collectible card. Evolves from Gabumon or Elecmon. Can evolve to Skull Greymon. 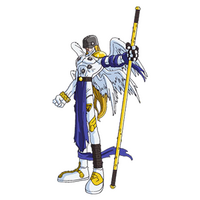 Angemon is a partner Digimon. 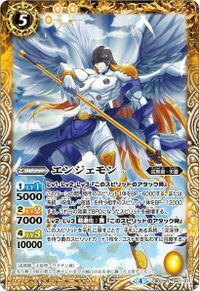 Evolves from Patamon and can evolve to Holy Angemon. Evolves from Agumon or Plotmon. 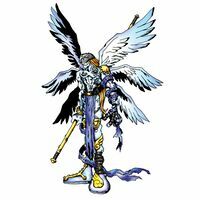 Can evolve to Holy Angemon or be Jogressed with a compatible Digimon to get Metal Mamemon or Angewomon. Evolves form Patamon, Terriermon or Impmon. Can evolve to Holy Angemon, Bastemon, Neo Devimon or Lady Devimon. Can also be Jogressed with Witchmon (Pendulum Progress 2.0), Tyranomon (1.0) or Dobermon (3.0) to get Angewomon or with Tailmon (D-Scanner 2.0) to get Andiramon. Evolves from Patamon. Can evolve to Holy Angemon or Vamdemon. 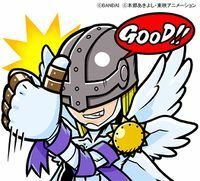 This Angel Digimon brings happiness! It strikes at evil with its shining fist!! I will never permit evil! It buries the opponent with holy power! All hearts filled with love shall be treated equally...and all evildoers shall repent and reform! This disciple was sent to spread the light of virtue across the entire Digital World! The evil of the net will be blown away by the winds of God! It purifies evil with its shining holy fist! A merciless enforcer from the heavens, it speaks with the justice of its golden fists! Its fist shines golden as it uses its Heaven's Knuckle. Its divine form, recognized by Digimon all over, is undeniably the embodiment of "virtue". 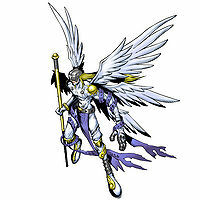 A Digimon with six large wings and a kind heart that loves peace and justice. It brings down the hammer of justice with its golden shining fist. 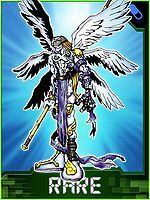 An Angel Digimon with a divine appearance. Its role in Sand Zone was to protect the Zone as a legendary warrior. A Digimon dispatched by a virtuous being in the Digital World, it carries out the complete extermination of evil. It is said to bring happiness, due to its 6 divine wings. 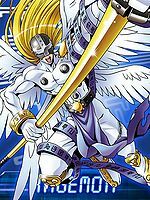 An Angel Digimon with six shining wings, whose body is clad in cloth so pure white as to be divine. Digimon Xros Wars Digimon Xros Wars Digimon Adventure tri. ↑ Digimon Adventure: "Angemon's Awakening!" 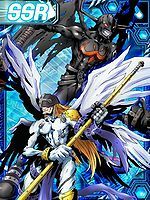 ↑ Digimon Adventure: "The Holy Swordsman, Holy Angemon"
↑ Digimon Adventure 02: "Steel Angel, Shakkoumon"